Thursday, May 18, 2017, the Nebraska Section held its Centennial Gala and Annual Meeting. Following red carpet photos and a brief presentation about ASCE from Society Past President Mark Woodson, P.E., L.S., F.SEI, D.WRE, ENV SP, F.ASCE (bio), members and special guests were treated to a showing of "Dream Big" on the IMAX screen at the Henry Doorly Zoo. Attendees were then given a chance to tour the aquarium while enjoying food, drink, and good conversation. Mark Woodson and Region 7 Director Marsia Geldert-Murphey, P.E., M.ASCE assisted with the awards presentation. 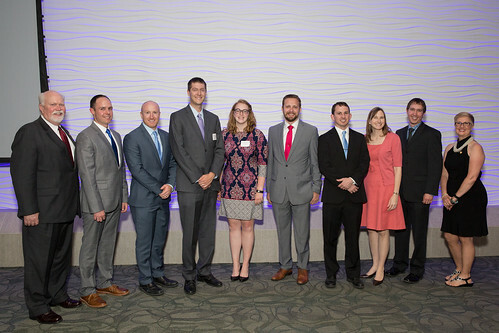 We welcomed nine new life members, honored Outstanding Seniors from the Lincoln and Omaha Student Chapters, presented awards for Outstanding Service and Long Term Service, and thanked the Centennial Committee for the efforts . Election and installation of the 2017-2018 officers rounded out the evening before attendees braved the rain with their swag bags. View all the red carpet photos and more! Sunday, April 2, 2017, the Nebraska Section hosted an outreach event at the Lincoln Children's Museum. In just two hours (2pm-4pm), roughly 75 kids and their parents visited our activity area to make gumdrop domes, paper towers, and build with Keva Planks. NEASCE distributed drawstring backpacks with handouts on Civil Engineering, stickers, building blocks (Duplos or Legos), and more. 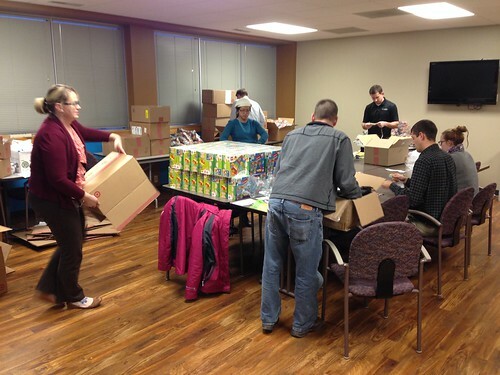 Thanks to Bill Arneson, Shannon DeVivo, Greg Seib, and Mike Sklenar for volunteering the day of the event - and to those who helped stuff the backpacks ahead of time. Wednesday, February 8, 2017, Governor Pete Ricketts signed a Proclamation recognizing 2017 as the Centennial year of the Nebraska Section. 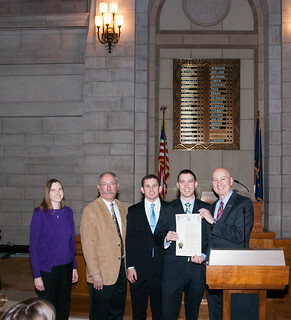 John Smith, P.E., M.ASCE, spoke on behalf of the Section during the signing in the Warner Chamber of the Nebraska State Capitol. He was joined by Bill Arneson, P.E., M.ASCE (Legislative Affairs, Section President 1990); Greg Seib, P.E., M.ASCE (Vice President); and Marie Stamm, P.E., M.ASCE (Director, Section President, 2008-2009). Read the Proclamation. Saturday, January 28, 2017, the Nebraska Section hosted an outreach event at the Omaha Children's Museum. Between 9am and 5pm, over 400 kids and their families participated. They made gumdrop domes (toothpicks and gumdrops or marshmallows), played with Keva Planks, and used paper to make towers. NEASCE distributed drawstring backpacks with handouts on Civil Engineering, stickers, building blocks (Duplo and Lego type), and more. Thanks to all those who attended (volunteers and participants), with special thanks to Shannon DeVivo, P.E., M.ASCE (Section President 2012-2013) for coordinating. Questions or want to know more?